Ever since I moved temporarily to Copenhagen I found myself wearing only more casual clothing. Polo shirts are definitely those that benefited most from my new work environment. 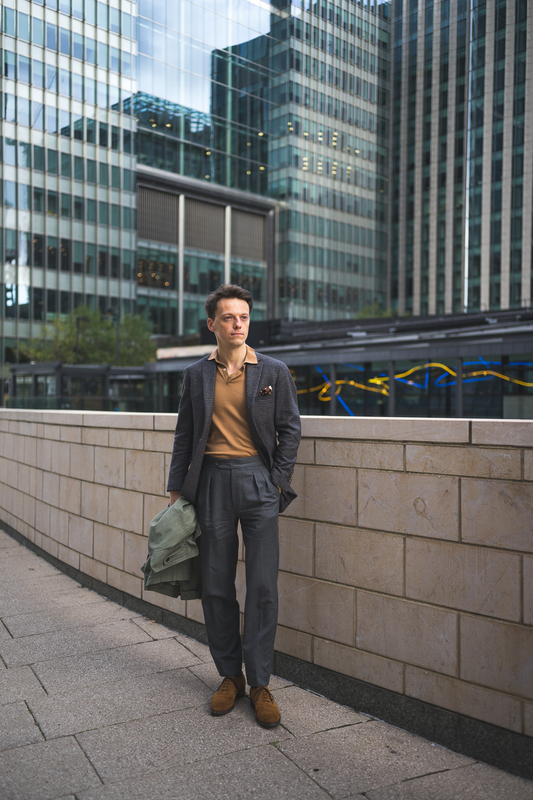 The office is much more casual than The City in London and wearing polo shirts, sweaters, cardigans etc. is very popular and suitable. Today I would like to show you John Smedley polo shirt in extra fine merino wool that I have been trying recently. 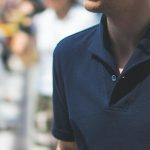 Disclaimer: I received this polo shirt from John Smedley for review. All views are mine. As you might know I am a big fan of comfort and softness of garments I wear. Those that are most comfortable get the most use and hence are the most popular. Sleeveless cashmere cardigans, sport coats, pique cotton polo shirts are amongst them. One of the items that is getting more popular, rightfully, is long sleeve knitted polo shirt in merino wool. In terms of colour there are numerous options. 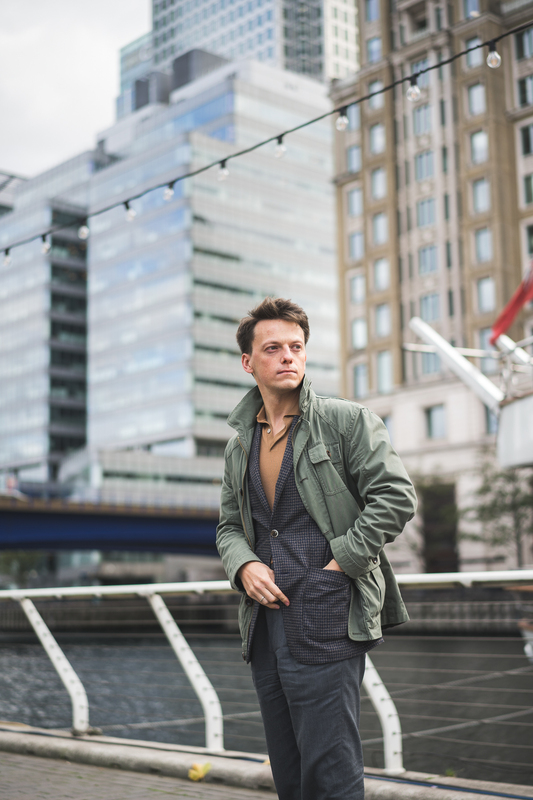 Clearly the most popular are the classic menswear ones: navy, grey, charcoal or green and brown. However I decided to go for something more unusual – camel. It is a very nice autumn tone. 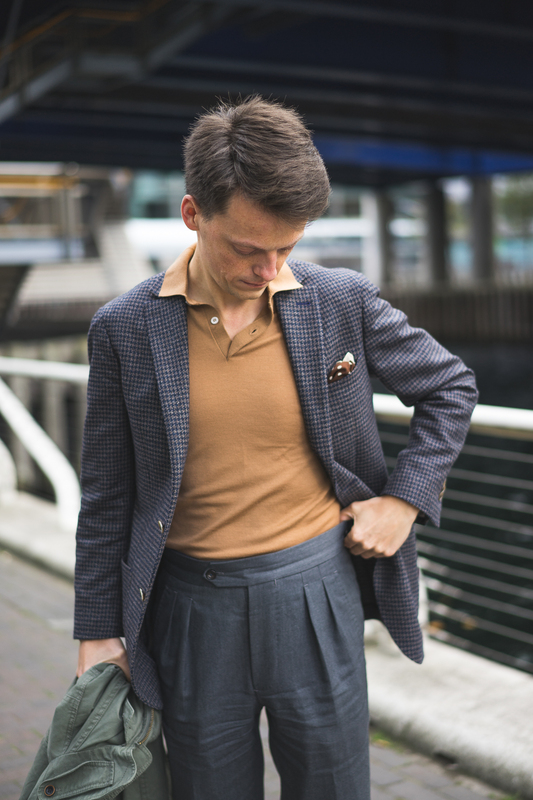 I am sure many of you would hesitate (as I did initially), however I already own cardigans in the classic colours and thought this one might freshen-up the look. It turns out it works great with the most common (alias boring) option for trousers: grey flannel. 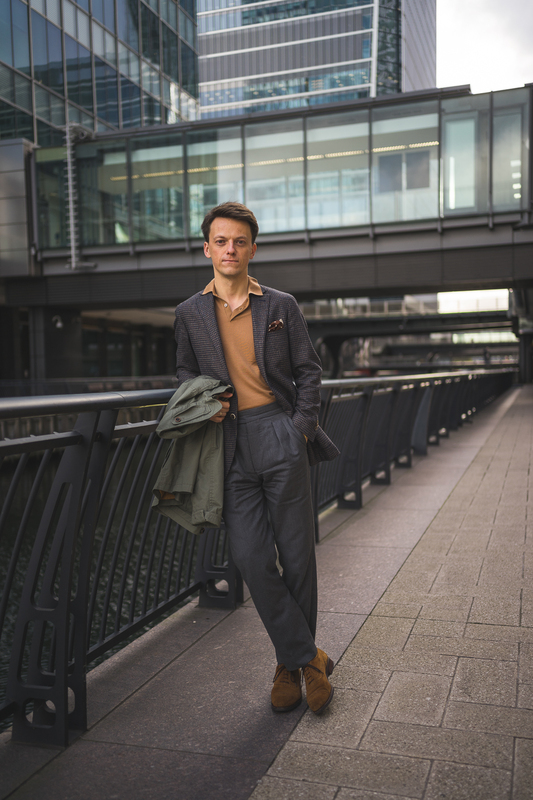 Maybe light grey flannel would have been even better with more contrast between polo shirt and trousers but both do very well. John Smedley polo shirt is made of extra fine merino wool on a 30 gauge. It is really soft and therefore comfortable to wear. You would also be surprised how warm it is. Almost like having another layer on a shirt. I only wear it on bare skin though because the cut is rather fitted. The model I have is called Garda and is in so-called Italian fit. It is shorter than other models and also more slim in the body. I would advice you to wear it with high waisted trousers. It might be too short to wear with denim unfortunately. If you would plan to wear it more casually then go for one of the other models that are longer in the body. 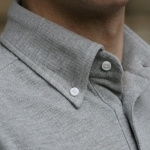 John Smedley also offers two collar versions, one shorter and the other with longer points. 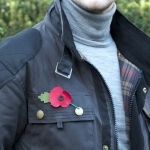 Both work well buttoned up but also as worn over the collar of the jacket (see photo below). Intentionally I am showing you both ways. On one hand I can’t really decide which one is preferred on the other you can see how the collar looks in both situations. 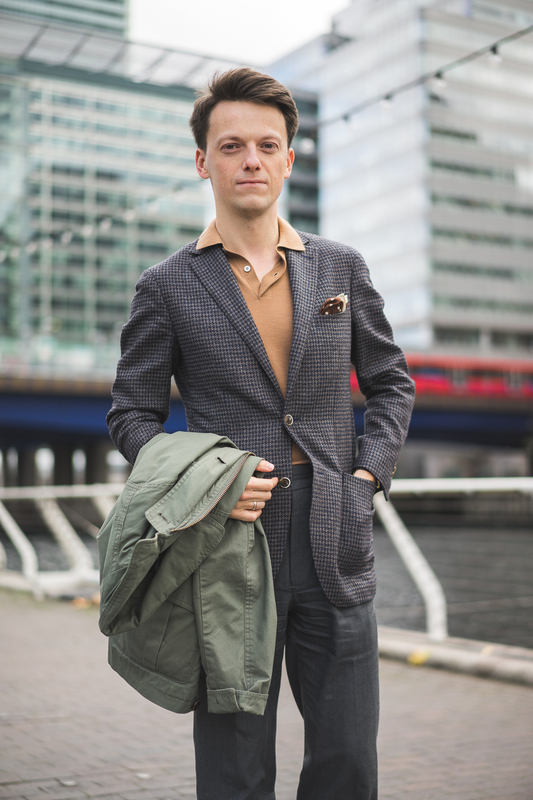 Doesn’t the over the jacket way remind you of Italy while the buttoned up version is more English? 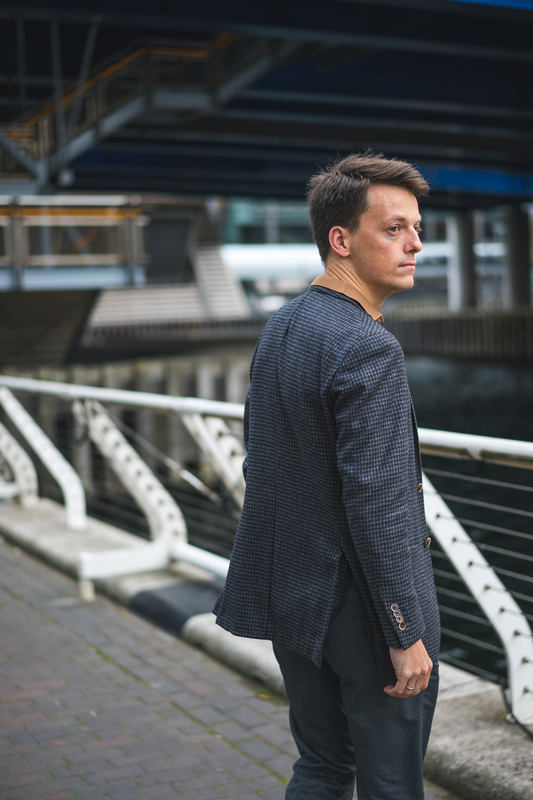 Considering we took the photos in the Canary Wharf I should have left it buttoned up all the time! Joking aside I believe it really shows the versatility of the polo shirt. I am usually size 36/small and I find the Italian style to be rather fitted and close to the body. You can comfortably wear it under the sport coat because it feels very much like a thicker shirt. It is not baggy at all. If you are athletic and fit enough you can also wear it without anything. 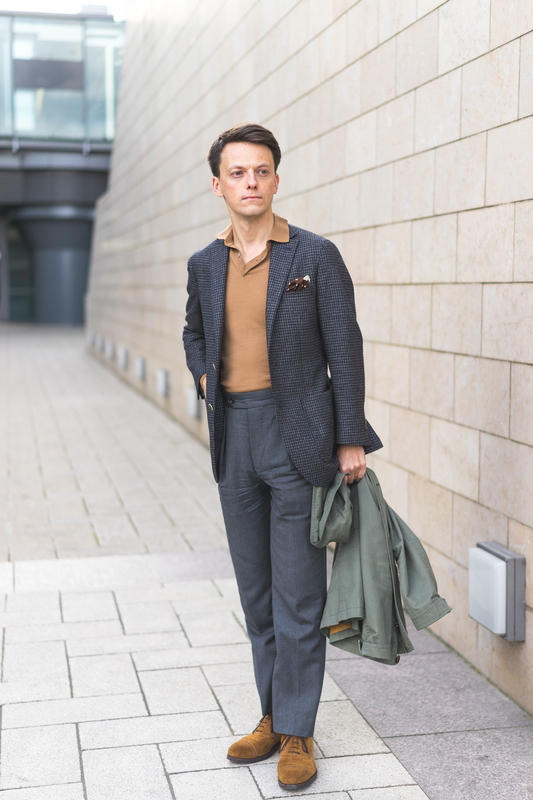 With high waisted trousers it is a very elegant look in my opinion. 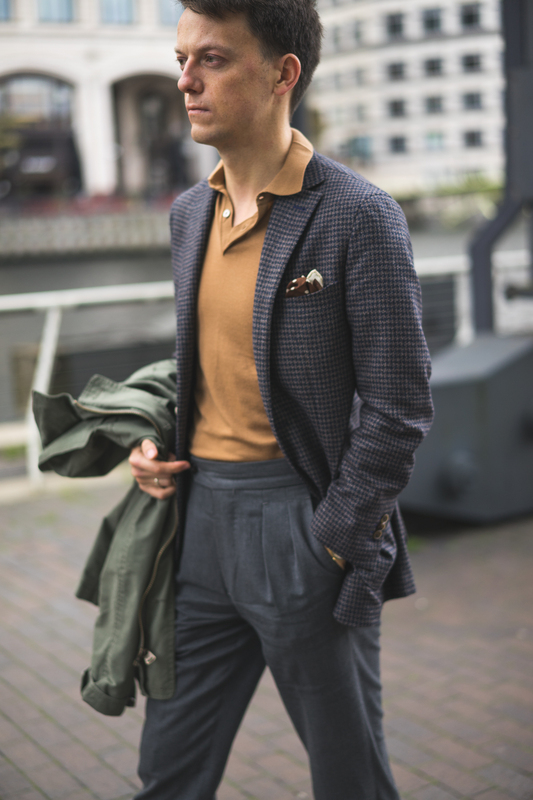 Camel works particularly well with grey, blue and brown! 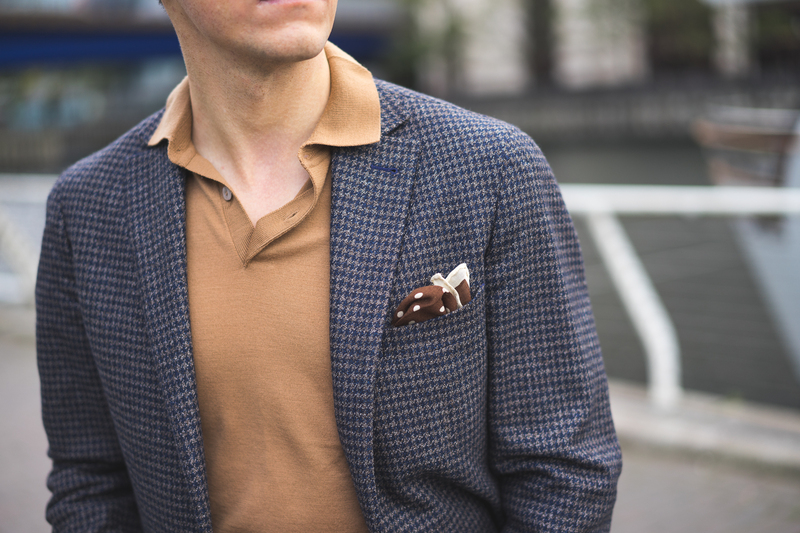 Can you see the subtle addition of brown pocket square? I think it might have actually made the whole outfit look fantastic. Otherwise the combination lacks character and could be called dull. 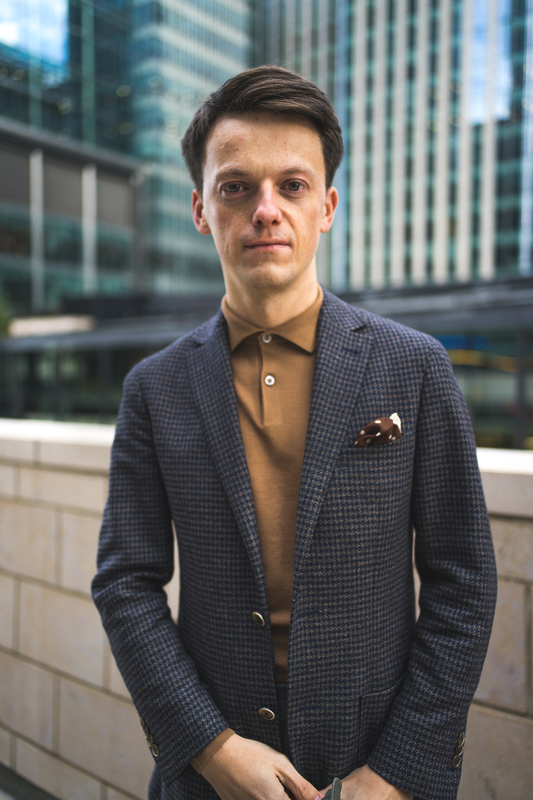 Polo suede semi-brogue shoes on rubber/leather sole are a must have for autumn weather and I love them for their casualness and versatility. It is such a successful model by Carmina (Rain last). They are in a more yellow tone than polo so complement each other quite well. 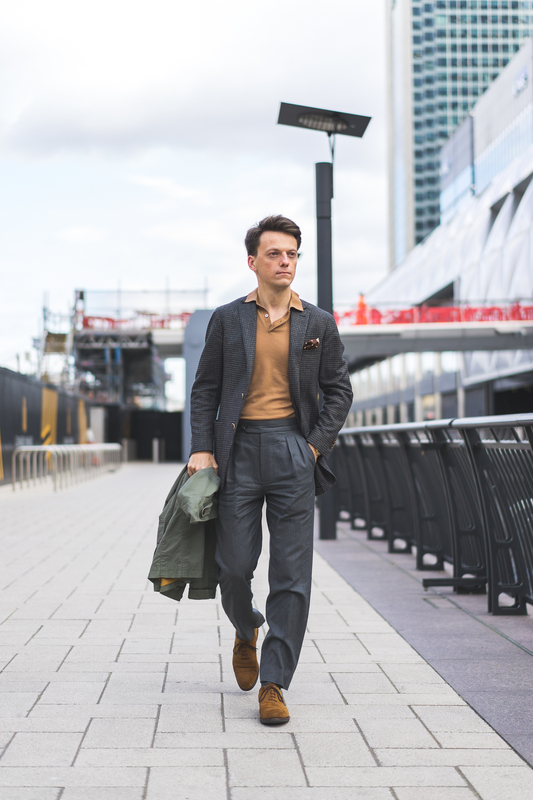 You could go for classic dark brown chukka boots or loafers if you want too. In summary I think it is a lovely product. 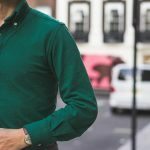 John Smedley polo shirt in long sleeve version is certainly well made, the extra fine merino wool feels very soft and comfortable, even on the bare skin. So many colours and style options are on offer that it is almost confusing. They differ in fit and collar style as well as in the fabric: either merino wool or sea island cotton. 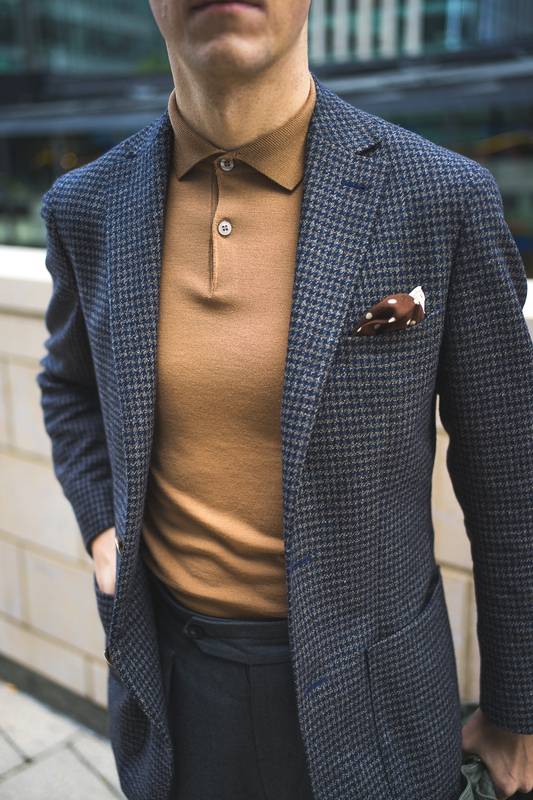 A look with long sleeve knitted polo and sport coat must be one of the most popular now. I love it for its casualness paired with tailoring. Many RTW and MTM brands started offering them in beautiful and soft fabrics, both wool and cashmere. British brands producing in Scotland are certainly experts and surely John Smedley is one of the finest. On the downside, I would say that if I was the designer I would make the total length of all the Smedley models as long as i.e. Finchley model, which is approx. 5cm longer in the Small size than Garda. It would be much easier to keep the bottom sit well in the trousers. If your trousers are not high waisted then it would surely be too short. Unless the sizing is ok for you and it is only me who has relatively long torso compared to legs. Let me know! Thanks for reading guys! Hope you enjoy this post. Please see more photos below.